The Deerstalkers of Welshpool was formed in March 2001 by Roy Upton-Holder, a woodwind teacher by profession, who has been a keen Holmes enthusiast since 1950. He decided to form the Sherlock Holmes Society having met several people who expressed an interest in the great fictional, although thoght by some to be real, detective. The majority of members live within a radius of 25 miles of Welshpool but some do come from further afield, including one who lives in Lewes, Sussex, one in Sunderland and one in Leicester. 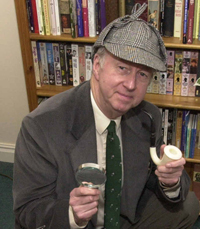 In October 2001, the actor Roger Llewellyn, who has toured the world performing Sherlock Holmes …the last act ! , a play written specially for him by David Stuart Davies (founder of The Northern Musgraves, and editor of the magazine Sherlock ) kindly accepted an invitation to become president of the Deerstalkers.